Gesture navigation is the way of the future: it's convenient when done right, it frees up screen space that buttons would otherwise occupy, and it can make a touchscreen experience much more fluid and enjoyable, but in the present gesture implementations feel... a bit broken. 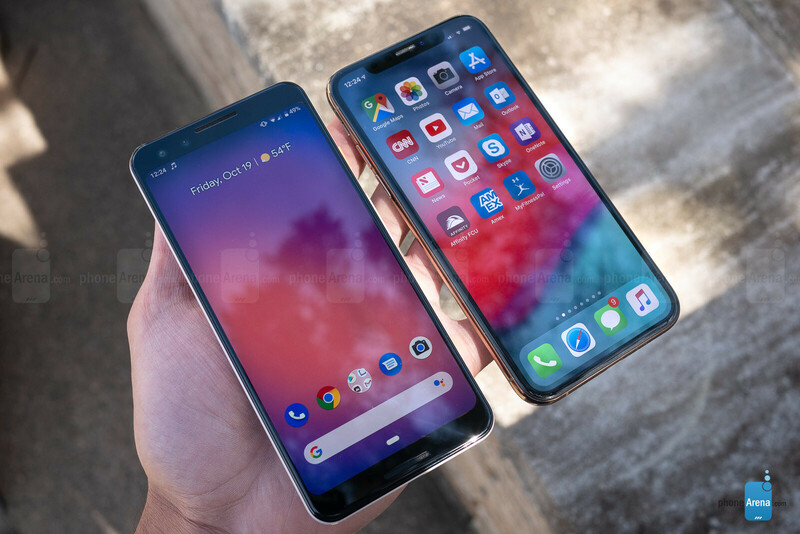 From my point of view as someone who reviews all sorts of phones and switches between devices quite often, I can easily see how various approaches to gesture navigation differ. And I have been thinking about how I am yet to see a perfect implementation of a gesture navigation interface, which is quite sad. So... let me first walk you through the way different companies do gestures, with all the pros and cons of each approach, and then I will try to convince you that a universally agreed gesture interface would be the best thing that can happen to the industry and for the users. Gesture navigation on a smartphone first appeared many years ago with the Palm Pre in 2009. 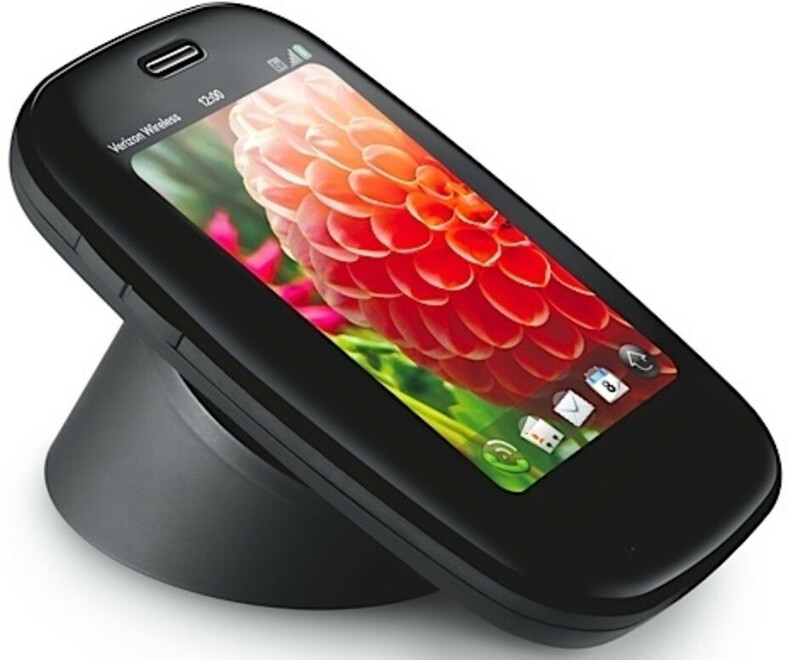 The phone launched with webOS, a completely new take on a mobile operating system, and other Palm phones later on also ran on it, but for one reason or another those devices never took off and all the great ideas from back then disappeared for a good 9 years or so. We will not go back in time that far, but let's just say that Palm and webOS truly were ahead of their time with gestures, and we ought to keep that in mind. A full 9 years after the original Pre, gestures returned with a bang. Apple was the first modern smartphone maker to reinvent gestures with the iPhone X and all the rest took notice. The gesture navigation that you can now use on the iPhone X, XS, XS Max and XR stands out with its speed, fluidity and refinement that others cannot quite match yet. It's impressive to see how everything runs in buttery smooth 60fps, how you can interrupt a gesture half-way and how everything responds so quickly. However, gestures on the iPhone are not perfect in my opinion and I found these important flaws: first, the back gesture is compromised. I like that you swipe from the side to go back, and you don't have to stretch your phone to swipe from the bottom like on many other devices, but for some reason the back gesture will work only in certain apps and not in others! For example, inside the App Store you cannot use the back gesture, but instead you have to tap on buttons to close an article and effectively go back a step. As a right-handed person, I also find it hard to reach all the way to the left side of the phone to swipe back and I really think you should be able to use a swipe from either side to go back. And do we really need to stretch all the way to the right ear on the bigger iPhones in order to see Control Center? 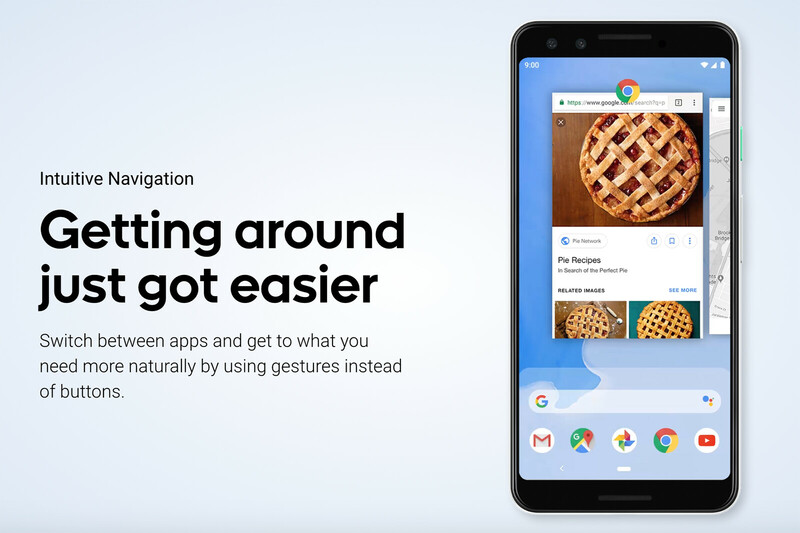 It took Google almost a year to match Apple and it was finally ready with its own take on gesture navigation in the Android 9 Pie release in the fall of 2018. And it was and still is... a complete disaster! Google's gesture implementation is not really a true gesture navigation at all. It's a weird mix: you have a gesture to go to the home screen, but you have no gesture to go back a step, and you still have that button. So rather than freeing up space on the screen from navigational buttons, you still have buttons and gestures on top of that! The problem with this is that once you start swiping from navigation, when you have to tap, it feels like something breaks the fluidity of the interface. And that's exactly what's happening with Google's implementation. It's chaotic, it's a mess, and it's no wonder that other Android phone makers are doing something completely different rather than adopting Google's gesture interface. Samsung is only now starting to adopt a gesture interface, almost a year and a half after Apple, so it should have had the time to perfect it, right? Well, not really. 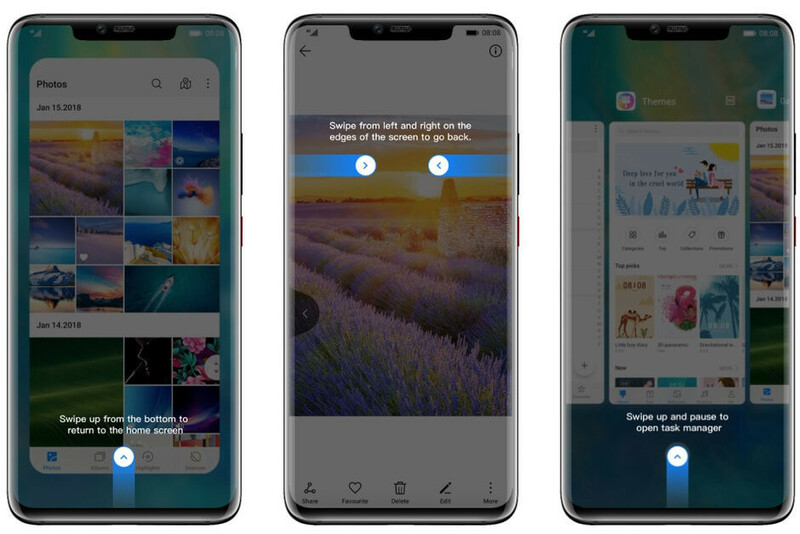 Samsung's gesture navigation consists of three gestures and all of them involve a swipe from the bottom, while the side of the phone is not used for gestures at all. The problem with this is that, first, the space at the bottom of the phone for swiping feels cramped, and second, that it's physically hard to stretch your finger to swipe from the bottom and it breaks the fluidity that is one of the fundamental benefit of gestures. My wish is that Samsung used the sides of the phone for gestures, rather than ignore that part of the phone entirely. LG still does not have a gesture interface! That's how late it is to the game. Hopefully, the company will introduce it with its upcoming LG G8 ThinQ flagship that we expect to see in less than a month! Huawei has been one of the first Android phone makers to adopt a gesture navigation interface and one that is among our favorites. My favorite part of Huawei's gestures is that you can swipe from both sides of the phone to go back a step and this works in all apps, universally! This is great! Other gestures on Huawei phones are also quite logical: swipe up from the bottom to go to the home screen, and swipe up and pause to see recent apps in a card view. My issue with Huawei's gestures is the jittery animations. You notice this the more you use these phones, and while it's not a dealbreaker, it's definitely an annoying "feature". OnePlus has also been among the first to implement gestures on Android and its implementation is probably the one that performs fastest, with smooth 60fps animations. However, the back gesture here is a swipe from the bottom edge of the phone. On a phone as big as the OnePlus 6 or 6T, this is a stretch, especially when you need to swipe between apps more often and your fingers physically tire. So once again, for some reason, OnePlus has completely eliminated the use of the sides of the phone for its gesture interface, something that I find perplexing and odd. The Dream Gesture Navigation Method! The more I use different phones, the more I am convinced that we need a great, non-compromised, unified gesture navigation system. One that is both convenient and one that works everywhere, one with smooth performance and refined animations. And I know it's probably not going to happen, but I really wish smartphone manufacturers got together to figure this one out. Having a great navigation system lies at the very fundamental level of a good smartphone experience. A unified gesture system is the USB-C of mobile software, something that seemed impossible, but something that I believe should unite all phone makers rather than divide them. For me, a perfect navigation system would be a mix between the fluidity and speed of Apple's gesture navigation ideas, coupled with the universal nature of the back gesture on Android that works everywhere and every time, coupled with a back gesture that is a swipe from either side of the phone, so you don't need to stretch your hand unnaturally every time you go back a step. Something simple like this across all phones would be a game-changer and would make phones so much more enjoyable to use. And then, you can always have other alternatives on top of that foundation, but it is the foundation that is missing right now and the result is one big mess. Do you think that we should have a unified gesture navigation that will work well across all phones? And what would such a system look to you? Apple was the first modern smartphone maker to adopt gestures with the iPhone X and all the rest took notice. Oh, so blackberry didn't happen before Apple? Nothing wrong if you prefer Apple, but let's please not forget that as usual, they copied also. And Palm happened even earlier than that! Of course! But none of them had the influence that Apple had with its gesture navigation. Only when Apple started using gesture navigation, the Android manufacturers started implementing gestures in their own system. But that's not the point. The point is that both Apple's implementation feels broken, just in a different way than on Android, and I very much want to see a good navigation system across all phones rather than some meaningless fan wars over which one is the best. "Only when Apple started using gesture navigation, the Android manufacturers started implementing gestures in their own system." How about you say, Only when Palm started using gesture navigation, the Apple manufacturer started implementing gestures in their own system. Again, the audience can only take you seriously if you stick to reporting facts. This pro-apple spin isn't needed. Victor don't delete my posts. Android has a back button. Just because you are not use to it, doesn't mean it's a disaster Victor. You curse Apple for inconsistent back gesture. Yet at least Android is consistent for its back button. Who cares if it doesn't have a back gesture. It's something you get use to, especially if you use it consistently. Clearly you are not using Android consistently, and it shows in this article you wrote Victor. The thing to take away from this, is if you are using both platforms, but prefer one platform over the other, then you will forget to change how you operate when switching between platforms. What you want is a consistent interface between iOS and Android. Maybe someone will make an iOS gesture interface for Android. Remember it's the platform that can allow things like that to happen. iOS is our way or take the Highway. 2y before bb even thought about introducing touchscreens Nokia had the N9; that phone was more influencing for the modern smartphones than all the bb phones put together. Stop drinking the Apple Kool-Aid Victor. You, Adrian D, Cosmin V & DEFINITELY Ray S make this site look real bad. You and the rest of 'wannabe iWriters' I mentioned above write these kind of iBS articles(including ALL iPhone reviews) all the time, letting your readers know that the iBias is real but still have the audacity to get mad at your readers for saying 'iPA'. You guys even go beyond that by deleting & moderating comments that doesn't favor your iMighty aka Apple. Are we all in North Korea or something? They didn't if you're pro-apple. What I hate is the fact that some Apple fan will soon be making similar false statements in a phone discussion with me and be sure he knows what he's saying. Leo_MC & midan's very good at that. They'd even lie, too. Google has the most ugly gesture of them all . Xioami has the best. I sort of love the Google one also. "I really think you should be able to use a swipe from either side to go back" Swipe from right already have function, you go forward. Gestures are the future. I never used stock android gestures, but the Note 9 nails them. The Max and Note 9 are neck and neck, with gestures. I love the Note 9's different areas, for different gesture actions though at the bottom. Gesture navigation has probably become the best way to offset the advent of massive phones. I don’t think I could handle an Xs Max (Still a stupid name) without them. On the Android side of things, Xiaomi seems to do gestures best with 1+ being a close second. Google’s are just... awful. Both visually and functionally compared to the competition, stock Android is behind in terms of fluidity. Kind of ironic too, considering Android has fat more ties to Palm OS than any other operating system. Having used Samsungs one UI for a few weeks now, a well thought out OS is the best way to enjoy a larger screen. 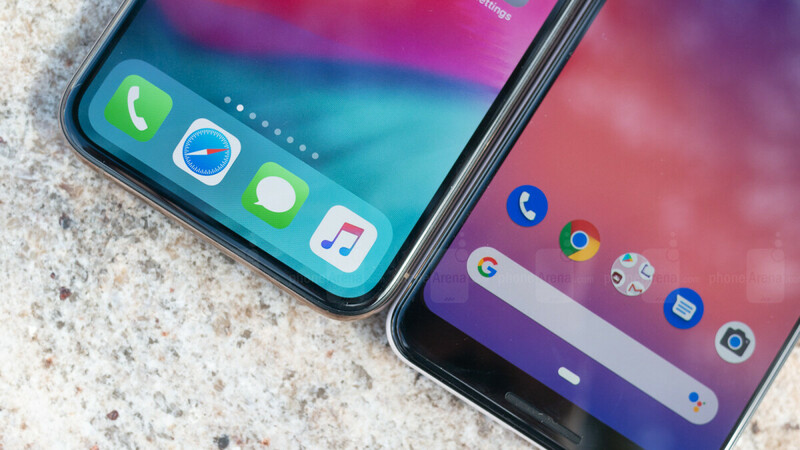 Android has always been way ahead of IOS in ease of use for larger phones, simply because you can bring icons and widgets to the bottom and have the three control buttons within easy reach at the bottom too. Just use the OnePlus gestures. They are perfectly logical and easy to use. You totally forgot Motorola, which has the best in my opinion. It's just a shame that their phones are not on the level of the other flagships. I swear to the living God above, that Samsung also has side gestures if you wanna use those. I'm literally using them rn, am I going nuts? 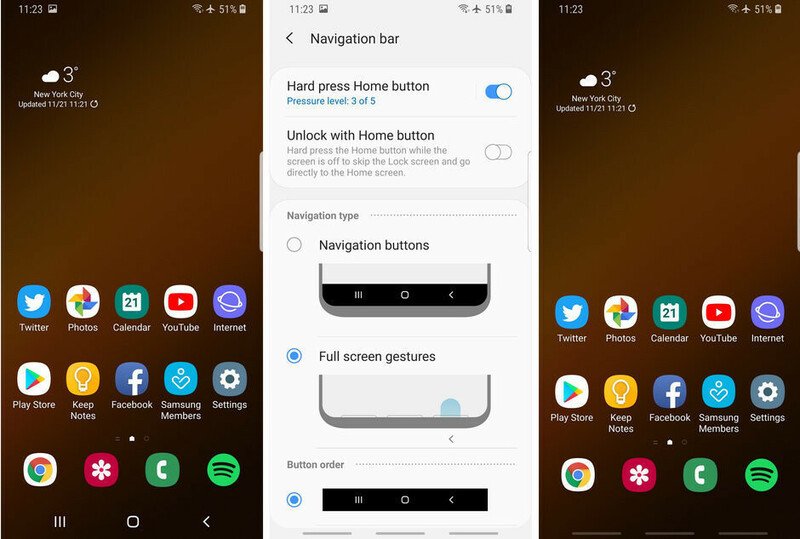 I use the app "Fluid Navigation Gestures" by Francisco Barroso, and after using ADB on Linux Mint my Android phones all have good Gestures and no navigation buttons...! Actually, gestures on my S9+ are excellent. I already forgot about navigation buttons. Apple made a difference for whatever you use. The article is right! Gesture navigation is the future but it needs a lot of polishing to perfect the navigation through the UI. It'll get there. Some of you blindly hate Apple, Palm and BlackBerry flopped and had little influence on the market. Like it or not when Apple does something, even when they aren't first, the industry takes notice. Did you mean the gestures implemented with the Meego Nokia N9 author?